Isn’t this cute. Imagine a whole classroom full of these little turkeys. If time permits, use the handprints of the kids for the feathers. I have included a pattern for handprints if you want to have them printed out before class. 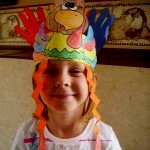 We call these “Turkey Headband.” The patterns and instructions are in the 1st Grade Projects Gallery in the sidebar. This entry was posted in 1st Grade, Thanksgiving and tagged 1st grade, art, easy headband craft, easy turkey headband, for kids, projects for kids, thanksgiving crafts, thanksgiving crafts for kids, thanksgiving headband for kids, thanksgiving projects for kids, thanksgiving turkey headband. Bookmark the permalink.